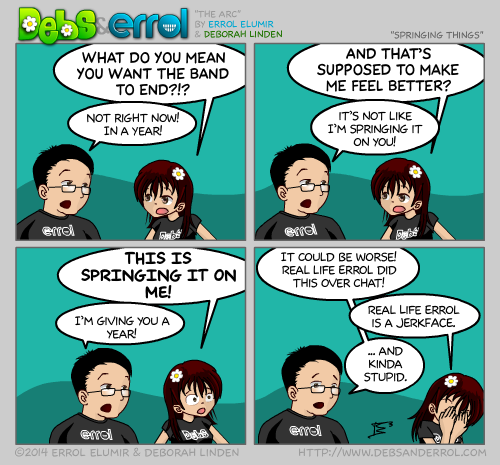 Errol: Remember THE BAND IS NOT ENDING! Please check Comic 986 for explanation of this story arc. And yes, Real life Errol is a jerk. Funny thing, I thought Debs knew. Debs: I didn’t know. 😛 It really felt as though you sprung it on me, Errol. It’s pretty hard to read intent over chat. Hey, I totally concur with all of you! This just makes me want to be able to give Debs a big hug.